To date, the occurrence of diabetes mellitus is greatly augmenting. Diabetes, which is well known as the high blood sugar level, is a metabolic ailment. Lack of insulin production or the cells failure to utilize insulin competently in the body contributes to the development of diabetes. By the year 2030, WHO foresees that diabetes will be one of the top ten major reasons of all deaths globally. This is due to the fact that diabetes engages in the advancement of other health complications such as heart attacks, stroke and kidney failure. There are two main elements ascertained to be associated with the accelerated occurrence of diabetes, including lifestyle factors and genetic makeup. Unhealthy lifestyle that provokes the lessening of physical activity, poor diet and obesity are the leading contributors to this chronic condition. At present, pharmaceutical market caters a variety of diabetes drugs and insulin therapy. Nevertheless, these diabetic drugs are often encountered with various side effects which include hypoglycemia, weight gain, lactic acidosis, nausea and peripheral edema. Besides, the clinically established diabetes drugs were also reported not economical as well as confronted prominent treatment failures. Therefore, a better therapeutic agent is critically needed for the prevention and management of diabetes. Over the centuries, plants have documented countless medicinal significances for many diseases. There are a number of data reported on the usage of medicinal plants for the treatment of diabetes. Metformin is one of the substantial examples of diabetic drug isolated from medicinal plant. Hence, the need for novel antidiabetic drug from herbal medicines is indispensable. Pereskia bleo (P. bleo) (Kunth) is a member of Cactaceae family with thorny leaves native to West and South America and is widely distributed in tropical and subtropical parts of Asia such as India, Indonesia, Malaysia and Singapore,. Leaves extract of P. bleo had established prominent pharmacological activities such as antidiabetic, antimicrobial, antioxidant, antihypertension, antinociceptive and antiproliferative properties,. The leaves decoction of the plant is also reportedly used by pregnant ladies in the villages of Kelantan, Malaysia as antidiabetic remedy. Previous studies had reported that aqueous leaf extract of P. bleo significantly reduced the blood sugar concentration of alloxan induced diabetic Sprague-Dawley rats. However, there have been no reports on the antidiabetic activities from the fractions of P. bleo extract. It follows that the related antidiabetic activity of the plant crude extract might possibly be enhanced by a subsequent bioactivity guided fractionation step. The resulting bioactive fractions may also exhibit better antidiabetic potency in the in vivo study. Inspired by this, the current study was conducted in order to explore the hypoglycemic, antihyperglycemic and antihyperlipidemic potentials of crude leaf extracts of P. bleo as well as its bioactive fraction. Streptozotocin (STZ) was obtained from the Sigma-Aldrich company. Glibenclamide and metformin (standard drugs) used were from Hovid Bhd. (Malaysia). All other commercial reagents and solvents used were of analytical grade. Leaves of P. bleo were collected from Kubang Semang, Bukit Mertajam, Penang, Malaysia. The leaves were authenticated by the institution botanist and the voucher specimen (USM/ Herbarium/11609) was kept at Herbarium Unit. The dried powders were extracted for 24 h by maceration using petroleum ether. The residues were then re-extracted by chloroform, methanol and water serially using the same technique. Each extract was then filtered and was concentrated by using rotary evaporator (Rotavapor R-200, Buchi, Switzerland) under reduced pressure at 40 °C. The water extract was subjected to freeze-drying (FreeZone, MO, USA). All the four different solvent extracts were stored at 4 °C until use. Experiments were performed in healthy male adult Sprague Dawley rats (200 to 250 g) which were acquired from the Animal Research and Services Centre (ARASC), Universiti Sains Malaysia (USM) and acclimatized for one week in the Animal Transit Room, USM prior to experiments. The animals were housed in sanitized polypropylene cages (3 per cage) under the temperature of (23 ± 2) °C and (50 ± 5)% humidity. The rats were fed on standard laboratory diet with free access to water. The experimental protocol has been approved by the institutional animal ethics committee (Approval no. USM/ Animal Ethics Approval / 2013/ (87) (463)). In this experiment, a total of 36 male Sprague Dawley rats were used. All the rats were kept fasting overnight providing water ad libitum. All the rats were casually allocated into six groups (n=6). Group 1, the negative control group received 10% tween 20; group 2, the positive control group received glibenclamide (10 mg/kg b.w. ); groups 3 to 6, the treatment groups received 1 000 mg/kg b.w. of petroleum ether extract, chloroform extract, methanol extract and aqueous extract of P. bleo, respectively. The treatments were administered orally to the rats. The effects of the vehicle, crude extracts treatment or glibenclamide on blood sugar levels were measured in fasted rats at zero, one, two, three, five and seven hours respectively after a single oral administration. Blood samples were withdrawn from the caudal tail vein in anesthetized rats. Blood sugar levels were ascertained using a glucometer (ACCU-CHEK® Performa). A total of 36 male Sprague Dawley rats were randomly assigned into six different groups (n=6 in each group) and fasted overnight. Group 1, the negative control group received 10% tween 20; group 2, the positive control group received metformin (500 mg/kg b.w. ); groups 3 to 6, the treatment groups received 1 000 mg/kg b.w. of petroleum ether extract, chloroform extract, methanol extract and aqueous extract of P. bleo respectively. Glucose (1 g/kg b.w.) was administered intraperitoneally within 1 h after the extracts were fed. Blood samples were withdrawn from rats at 0, 15, 30, 45, 60, 90 and 120 min. Blood sugar levels were verified using a glucometer (ACCU-CHEK® Performa). In short, a high fat diet was given to the rats for 4 weeks. At the end of 4 weeks, STZ (50 mg/kg b.w.) was injected intraperitoneally to the rats overnight fasted. After the STZ injection, the rats were given 5% glucose solution overnight as drinking water. After 72 h, rats with fasting blood sugar levels of more than 12 mmol/L were selected to include in the study. Rats in the normal control group (n=6) were fed with normal pellet diet and were administered buffer alone. A total of 42 STZ induced rats and 6 normal rats were assigned into eight groups. Group 1 and 2 which consisted of normal and diabetic control rats were delivered 10% tween 20. Groups 3 and 4 received glibenclamide (10 mg/kg b.w.) and metformin (500 mg/kg b.w. ), respectively. Groups 5 to 8 were delivered 1 000 mg/kg b.w. of petroleum ether extract, chloroform extract, methanol extract and aqueous extract, respectively. Treatments were delivered orally twice a day for 12 d. Blood sugar levels were ascertained using glucose meter (ACCU-CHEK® Performa). P. bleo aqueous extracts were further partitioned by solvent-solvent extraction method. An amount of 40 g of aqueous extract were suspended in 250 mL distilled water and were poured in 1 L separatory funnel. This extract was then partitioned by adding 750 mL of ethyl acetate. The fraction of ethyl acetate separated was collected and concentrated using rotary evaporator. Similar process was repeated to obtain the n-butanol fraction by replacing ethyl acetate with 750 mL of n-butanol. The residual water layer was collected and denoted as aqueous fraction. The diabetic induction was done in Sprague Dawley rats according to the method described in section 2.7.1. Only those rats with fasting glucose level exceeding 12 mmol/L were used. Thirty-six diabetic rats and 6 normal rats were allocated into seven groups (n=6). Groups 1 to 4 were given the same treatments as described previously in section 2.7.2. Group 5 to 7 received 500 mg/kg b.w. of ethyl acetate fraction, n-butanol fraction and aqueous fraction of P. bleo, respectively. Treatments were delivered orally twice a day for 12 d and the blood sugar levels were ascertained. The diabetic induction was done in Sprague Dawley rats according to the method described in section 2.7.1. The aqueous fraction of P. bleo aqueous extract was observed to be the most active fraction, hence it was used in this study to determine the minimum effective dose. The number of rats used was as same as depicted in section 2.9. Groups 1 to 4 were given the same treatments as described previously in section 2.7.2. Groups 5 to 7 received different doses of aqueous fractions that include 500 mg/kg b.w., 250 mg/kg b.w. and 125 mg/kg b.w., respectively. Treatments were delivered orally twice a day for 12 d and the blood sugar levels were ascertained. The diabetic induction was done in Sprague Dawley rats according to the method described in section 2.7.1. The number of rats used was as same as depicted in section 2.9. Groups 1 to 4 were given the same treatments as described previously in section 2.7.2. Group 5 received crude aqueous extract of 1 000 mg/kg b.w. Group 6 and 7 received aqueous fractions of 500 mg/kg b.w and 250 mg/kg b.w., respectively. Treatments were delivered orally twice a day for 12 d. After 12 days of treatment, the rats were anaesthetised with pentobarbitone sodium at 50 mg/kg b.w. intraperitoneally before the procedure was done. About 5 mL of blood samples were collected from the heart using 25 G needle and 5 mL syringe which then were transferred to 10 mL heparinised tubes for further studies. The heparinized tubes were immediately centrifuged at 2 000 ×g for 20 min at 4 °C to obtain plasma. Plasma insulin levels were measured by ELISA method using Ultra Sensitive Rat Insulin ELISA Kit (Crystal Chem, USA). The blood samples were collected in a tube. Lipid profile analysis was done by analysis of blood samples at a clinical laboratory [Gribbles Pathology (M) Sdn Bhd] to measure total cholesterol (TC), triglycerides (TG), low-density lipoprotein (LDL) and high-density lipoprotein (HDL). The weights of all the rats were measured and recorded on the third day of the diabetes induction (first day of treatment) and the last day of the treatment (day 12). The rats were fasted overnight before measurements were taken. All the data reported are expressed as mean ± SEM for 6 animals in each group. The hypothesis testing method used was one-way ANOVA followed by Dunnette's comparison tests. The values were considered significantly different at P<0.05. [Figure 1] represents the variation of blood sugar levels after delivering a single oral dose of various solvent extracts and aqueous extract of P. bleo to the normal rats. The rats which received treatments of methanol, chloroform and aqueous extracts displayed no hypoglycemic effect throughout test compared to the control group. 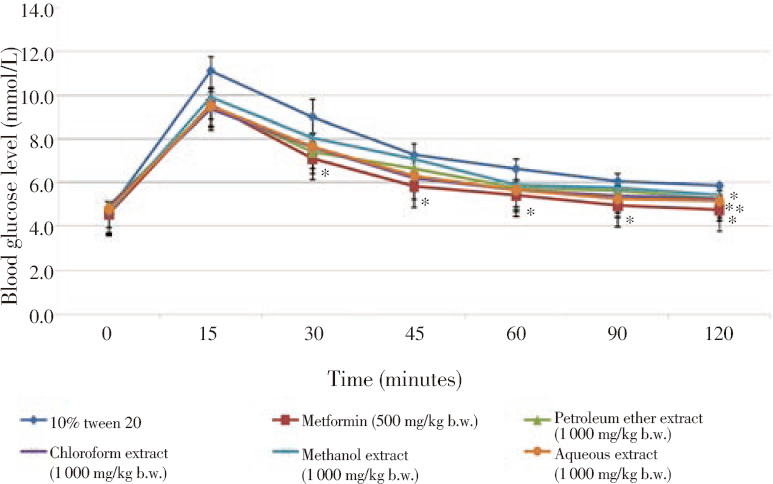 Petroleum ether extract-treated rats showed a reduction on blood glucose level at the third hour (4.1 mmol/L) but increased at the final hour of study. At this dose, entire rats were found conscious, and the behaviour and activity were normal compared to the control. Glibenclamide-treated rats demonstrated significant (P<0.05) hypoglycemic effect consistently from the first time point. Figure 1: Effect of oral administration of P. bleo extracts (1 000 mg/kg b.w.) on fasting blood glucose level in normal rats. Data are presented as mean ± SEM (n = 6). *Significant difference from control (P<0.05). The glucose tolerance effect of P. bleo crude extracts is illustrated in [Figure 2]. Rats in all the tested groups exhibited a sudden increase in their blood glucose level after glucose administration until the 15 min (i.p.). However, during the period of 30 min to 90 min, all the tested groups presented potential glucose lowering activity. At 120 min, rats treated with 1 000 mg/kg b.w. of petroleum ether, chloroform and aqueous extracts of P. bleo demonstrated significant (P<0.05) reduction on the blood glucose level compared to the control group. Notably, the efficiency of P. bleo extracts and metformin (500 mg/kg b.w.) in reducing the blood sugar level was almost comparable. Metformin has showed significant glucose lowering affect from 30 to 120 min. Figure 2: Effect of oral administration of P. bleo extracts (1 000 mg/kg b.w.) on fasting blood glucose level after intraperitoneal loading of 1 g/kg b.w. of glucose in normal rats. 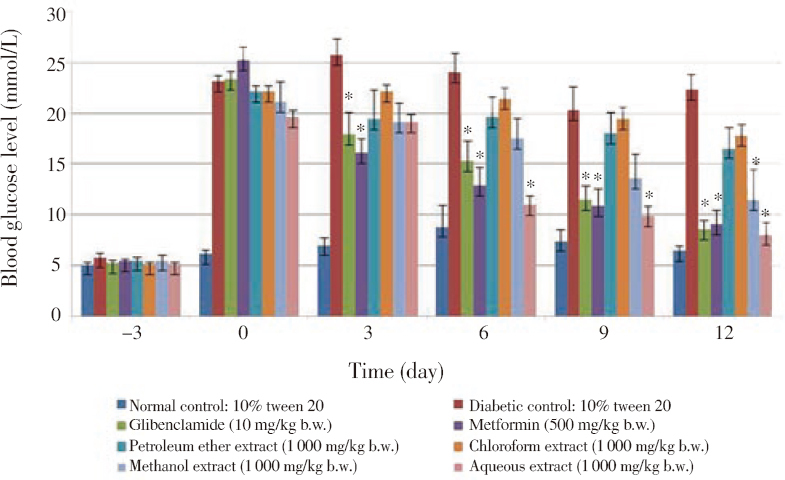 [Figure 3] displays the influence of the P. bleo extracts on diabetic rats during 12 days of daily oral administration. Diabetic rats treated with petroleum ether and chloroform extracts showed no significant effect on the blood glucose levels throughout the study. Methanol extracts, on the contrary, had significantly (P<0.05) lowered the blood glucose level of the diabetic rats on the day 12. Aqueous extract-treated diabetic rats have initiated reduction in blood glucose levels as early as day 3 and this reduction became more significantly pronounced on day 6 (11 mmol/L) till day 12 (8.1 mmol/L). Aqueous extract of P. bleo revealed potent blood glucose lowering effect compared to the clinically established diabetic drugs, glibenclamide and metformin [Figure 3]. Therefore, the crude aqueous extract was subjected to the fractionation study to further improve and investigate the antidiabetic activity. Figure 3: Antihyperglycemic effect of oral administration of P. bleo extracts (1 000 mg/kg b.w.) on fasting blood glucose level of STZ-induced diabetic rats. Data are presented as mean ± SEM (n = 6). *Significant difference from diabetic control (P<0.05). A total of three fractions namely ethyl acetate, n-butanol and aqueous fraction were obtained after the partitioning of the potent crude aqueous extract of P. bleo by solvent-solvent fractionation method. The effect of the P. bleo fractions on the blood glucose level in STZ induced diabetic rats is shown in [Figure 4]. A significant (P<0.05) reduction in blood glucose levels was observed after 12 days of oral treatment with ethyl acetate (12.3 mmol/L) and n-butanol (9.7 mmol/L) fractions in contrast to diabetic control (22.3 mmol/L). On the other side, the aqueous fraction treated rats had lowered the blood glucose significantly (P<0.05) from day 6 (14 mmol/L) to day 12 (6.2 mmol/L) compared to diabetic control. Interestingly, the aqueous fraction demonstrated comparable potency to those of glibenclamide and metformin which had lowered the blood sugar levels as soon as day 3 with 17.9 mmol/L and 16 mmol/L respectively. Therefore, aqueous fraction was chosen to dose response relationship study. Figure 4: Antihyperglycemic effect of oral administration of P. bleo aqueous extract fractions (500 mg/kg b.w.) on blood glucose of STZ-induced diabetic rats. [Figure 5] reveals the effect of different doses of P. bleo aqueous fraction on fasting blood glucose level in STZ induced diabetic rats. The treatment of 500 mg/kg b.w. and 250 mg/kg b.w. of P. bleo aqueous fractions showed reduction in the blood glucose level since day 6 (14 mmol/L and 16 mmol/L, respectively) compared to diabetic control (24.1 mmol/L). Nevertheless, rats treated with 125 mg/kg b.w. of P. bleo aqueous fraction did not show any significant blood glucose reduction. 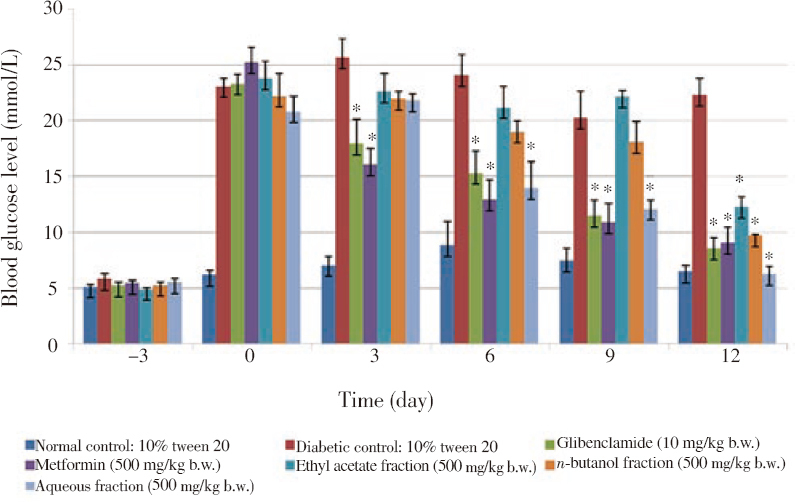 Figure 5: Antihyperglycemic effect of oral administration of P. bleo aqueous fraction at different doses on blood glucose of STZ-induced diabetic rats. [Figure 6] depicts the insulin level of the diabetic rats treated with crude aqueous extract (1 000 mg/kg b.w.) and aqueous fractions (500 and 250 mg/kg b.w.) of P. bleo for 12 d. Both the aqueous extract and fractions presented a significant (P<0.05) increase of the insulin level compared to diabetic control. The diabetic rats treated with 500 mg/kg b.w. of aqueous fraction, displayed the highest insulin concentration of 0.42 ng/mL, which was slightly higher than the normal control (0.41 ng/mL). Moreover, the insulin concentration of P. bleo aqueous fraction outshone the clinically established drug metformin at the same dosage (500 mg/kg b.w.) used. On the other hand, glibenclamide displayed an insulin rise of 0.25 ng/mL compared to diabetic control (0.10 ng/mL). 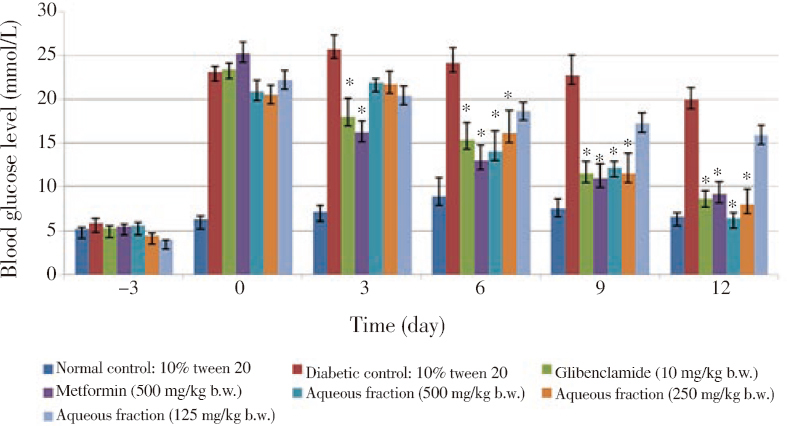 Figure 6: Antihyperglycemic effect of oral administration of P. bleo aqueous extract and aqueous fractions on plasma insulin of STZ-induced diabetic rats. The lipid profile of P. bleo aqueous extract (1 000 mg/kg b.w.) and aqueous fractions (500 mg/kg b.w. and 250 mg/kg b.w.) is shown in [Figure 7]. The serum TC, TG and LDL values were observed to be decreased for all treatments. HDL level was found to be increased significantly (P<0.05), except for aqueous extract treated rats which showed an increase in HDL level but not significant when compared to diabetic control. 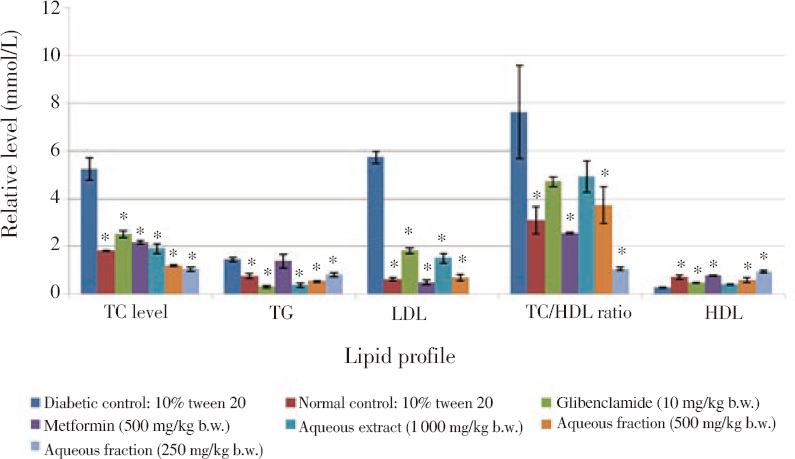 Figure 7: Antihyperlipidemic effect of oral administration of P. bleo aqueous extract and aqueous fractions on lipid profile of STZ-induced diabetic rats. All the diabetic rats reduced some body weight increment after diabetic induction [Figure 8]. However, the administration of aqueous extract (1 000 mg/kg b.w.) and aqueous fraction (250 mg/kg b.w.) exhibited significant (P<0.05) effect in ameliorating the decreasing percentage of the body weight in contrast to diabetic control rats. Figure 8: Effect of oral administration of P. bleo aqueous extract and aqueous fractions on body weight increment of STZ-induced diabetic rats. In the current study, P. bleo extracts were investigated for hypoglycemic properties in normal rats following an acute dose of 1 000 mg/kg b.w. The findings distinctly showed that P. bleo extracts do not provoke hypoglycemic action on acute dose and are capable to maintain the glycemic condition in non-diabetic rats. Meanwhile, glibenclamide lacks the credibility to regulate normal blood sugar level, which had exhibited functional hypoglycemic action in non-diabetic rats. This is because glibenclamide operates by provoking the β -cells in producing additional insulin from pancreas regardless of the glycemic status of the body. Apparently, the results indicate that P. bleo extracts may not manage the blood glucose levels through insulin secretion at an acute dose. This condition is very favourable as P. bleo extracts can be potential candidates for diabetes therapy replacing many clinical drugs that yield adverse reaction such as hypoglycemia. Our findings are the first one to demonstrate that acute dose of P. bleo extracts prevents hypoglycemia in normal rats. P. bleo extracts had compelling glucose resilience effects in normal rats. All the extracts demonstrated remarkable abilities to abstain the sudden arise of blood sugar level upon glucose injection. 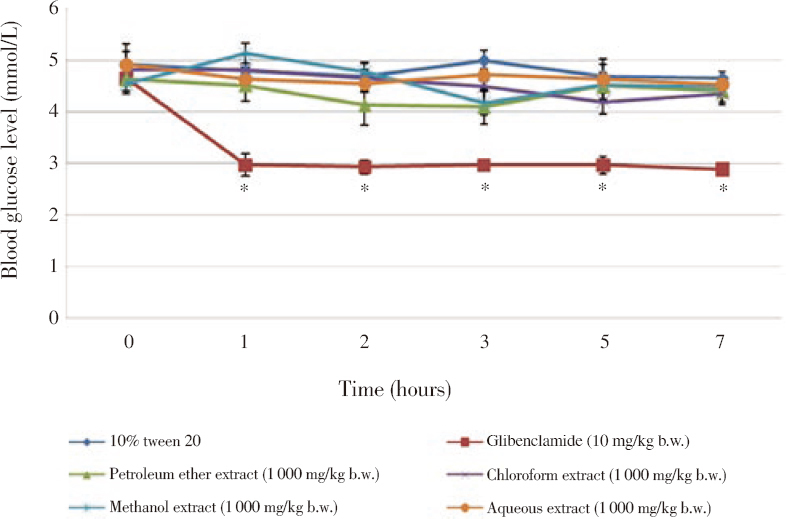 Though the reductions in glucose by petroleum ether, chloroform and aqueous extract were only significant at the end of 120th minute, the glucose lowering pattern by these extracts was comparable to that of standard drug used. In contrast, metformin showed significant blood glucose reduction as soon as 30th minute of the test. This is expected as metformin performs by extra-pancreatically obstructing hepatic gluconeogenesis without raising the insulin production,,. The similarity in the glucose lowering pattern as metformin may suggest that P. bleo extracts may be slow acting and require more time for the bioactivity potential. The mechanism underlying the antidiabetic property of P. bleo extracts was further investigated. In this study, human insulin-dependent diabetes mellitus was portrayed in animal model using STZ-induced diabetic rats. STZ forms reactive oxygen species that destructs the pancreatic β -cells thus leading to a condition where insulin is reliant on. Therefore, to overcome the drastic reduction of blood insulin concentration, the induced rats were immediately given 5% glucose solution ad libitum which had aided in regulating the insulin production and glucose restoration,. In current study, blood glucose readings were recorded on day 0, 3, 6, 9 and 12. Aqueous extract of P. bleo had significantly decreased blood glucose levels from day 6 till day 12 compared to other extracts. The results disclosed that the 12 days of routine treatment of P. bleo aqueous extract had stopped the blood sugar increase in STZ-diabetic rats. According to Arunachalam, the pancreatic release of insulin from the remaining β -cells may contribute to the antihyperglycemic response by the aqueous extract. Another possibility is that, after the eradication of β -cells by STZ, the aqueous extract administration had stimulated the regeneration ofβ -cells which eventually secretes insulin to reduce the blood sugar level in rats. Notably, the aqueous extract presented a superior blood sugar lowering activity in the 12 days of investigation compared to intraperitoneal glucose tolerance test. This could be due to the aqueous extract that required initial period of bioaccumulation to concert the antidiabetic effect. The aqueous extract being the most potent in antidiabetic activity compared to other solvent extracts of P. bleo, was further fractionated serially using different solvents of varying polarity. Of all the fractions studied, aqueous fraction demonstrated a strong antihyperglycemic property by significantly lowering the blood glucose level as early as day 6 of the experiment. Hence, a subsequent dose response relationship test was conducted on the aqueous fraction and the results showed that two different doses of 500 and 250 mg/kg b.w. of the aqueous fraction had significantly lowered the blood sugar level of the diabetic rats. These two doses of aqueous fraction along with aqueous extract were chosen to be tested on for insulin level, body weight and antihyperlipidemic properties. Insulin is one of the major hormones that regulates the blood glucose concentration. As stated by Ali et al, the most appropriate treatment for diabetes can be optimized by determining the insulin level in blood. Previously, various studies have proved that antihyperglycemic effect of plant extracts can be accredited to their insulin-trophic influence,. This is consistent with our results which had revealed the administration of 500 mg/kg b.w. of P. bleo aqueous fraction had escalated the plasma insulin significantly in contrast to diabetic control. Thereby, the aqueous fraction displayed direct insulinotropic action by stimulating the plasma insulin to improve the blood sugar level. Diversely, metformin exhibited the lowest insulin level which verifies its blood glucose reducing mechanism is through extrapancreatic cells. Besides managing the blood glucose level, the aqueous fractions of P. bleo showed potent antihyperlipidemic activity by controlling lipid contents of the diabetic rats. The aqueous fractions have lowered the TC, TG and LDL levels in STZ-induced diabetic rats followed by a significant increase of HDL contrast to the diabetic rats. Earlier, Mat Darus reported the similar lipid profile by the aqueous extract of P. bleo[l2]. Probably, the aqueous fractions of P. bleo also regulate the fatty acids flow. The serum lipid profile by the P. bleo aqueous fractions directly denotes its protective effects in diabetes associated complication such as cardiovascular disease. In diabetic condition, the imbalance of the metabolic pathways often contributes to a body weight decrease. However, aqueous extract (1 000 mg/kg b.w.) and aqueous fraction (250 mg/kg b.w.) of P. bleo had significantly reduced the body weight loss. According to Adiga et al, successful antidiabetic treatments are able to avoid body weight loss by monitoring muscle wasting. In conclusion, the overall study proved P. bleo as potential ethnomedicinal plant having remarkable antidiabetic and antihyperlipidemic activities. Aqueous fraction of P. bleo which possesses promising clinical value awaits further research and development as a new chemotherapeutic agent. Davies MJ, Fradkin J, Kernan WN, Mathieu C, Mingrone G, Rossing P, et al. Management of hyperglycaemia in type 2 diabetes, 2018. A consensus report by the American Diabetes Association (ADA) and the European Association for the Study of Diabetes (EASD). Diabetologia 2018; 61(12): 2461-2498. Chaudhury A, Duvoor C, Dendi VSR, Kraleti S, Chada A, Ravilla R, et al. Clinical review of antidiabetic drugs: Implications for type 2 diabetes mellitus management. Front Endocrinol 2017; 8: 6. Aroda VR, Knowler WC, Crandall JP, Perreault L, Edelstein SL, Jeffries SL. Metformin for diabetes prevention: Insights gained from the Diabetes Prevention Program/Diabetes Prevention Program Outcomes Study. Diabetologia 2017; 60(9): 1601-1611. Palmer SC, Mavridis D, Nicolucci A, Johnson DW, Tonelli M, Craig JC. Comparison of clinical outcomes and adverse events associated with glucose-lowering drugs in patients with type 2 diabetes: A meta-analysis. JAMA 2016; 316(3): 313-324. Giovannini P, Howes MR, Edwards SE. Data on medicinal plants used in Central America to manage diabetes and its sequelae (skin conditions, cardiovascular disease, kidney disease, urinary problem and vision loss). Data Brief 2016; 7: 1217-1220. Boo CM, Ou-Yang CL, Omar-Hor K. 1001 garden plants in Singapore. 2nd ed. Singapore: National Parks Board; 2006. Wahab SIA, Abdul AB, Mohan SM, Al-Zubairi AS, Elhassan MM, Ibrahim MY. Biological activities of Pereskia bleo extracts. Int J Pharmacol 2009; 5(1): 71-75. Zareisedehizadeh S, Tan CH, Koh HL. A review of botanical characteristics, traditional usage, chemical components, pharmacological activities, and safety of Pereskia bleo (Kunth) DC. Evid Based Complement Alternat Med 2014; 2014: 326107. Sharf KM, Rahman MM, Zaidul ISM, Jannatul A, Akanda MJH, Mohamed A, et al. Pharmacological relevence of primitive leafy cactuses Pereskia. Res J Biotechnol 2013; 8(12): 134-142. Yen KP, Abdullah MS, Syafri S, Raju SK, Che Yahya CAH. A preliminary survey on the medical uses and effectiveness of Pereskia bleo used by people of three villages in the State of Kelantan, Malaysia. Int J Herb Med 2013; 1(3): 1-4. Mat Darus NA, Mohamad J. Antidiabetic activity of Pereskia bleo aqueous extracts in alloxan induced diabetic rats. J Pharm Res 2017; 1(7): 000137. Nolte MS, Karam JH. Pancreatic hormones and antidiabetic drugs. In: Katzung BG (ed.) Basic and clinical pharmacology. 8th ed. New York: McGraw-Hill; 2001, p. 721-723. Rena G, Hardie DG, Pearson ER. The mechanisms of action of metformin. Diabetologia 2017; 60(9): 1577-1585. Gilbert C, Valois M, Koren G. Pregnancy outcome after first-trimester exposure to metformin: A meta-analysis. Fertil Steril 2016; 86(3): 658-663. Bouchoucha M, Uzzan B, Cohen R. Metformin and digestive disorders. Diabetes Metab 2011; 37(2): 90-96. Duan B, Zhao Z, Lin L, Jin J, Zhang L, Xiong H, et al. Antidiabetic effect of Tibetan medicine Tang-Kang-Fu-San on high-fat diet and streptozotocin-induced type 2 diabetic rats. Evid Based Complement Alternat Med 2017; 2017: 7302965. Otah AA, Augustine O, Obiora IO, Maxwell E. Anthyperglycaemic effects of the methanol leaf extract of Diaphananthe bidens in normoglycemic and streptozotocin-induced hyperglycaemic rats. Asian Pac J Trop Med 2012; 5(3): 192-196. Ramachandran B, Ravi K, Narayanan V, Kandaswamy M, Subramanian S. Protective effect of macrocyclic binuclear oxovanadium complex on oxidative stress in pancreas of streptozotocin induced diabetic rats. Chem-Biol Interact 2004; 149(1): 9-21. Arunachalam K, Parimelazhagan. Antidiabetic activity of Ficus amplissima Smith. bark extract in streptozotocin induced diabetic rats. J Ethnopharmacol 2013; 147(2): 302-310. Florence NT, Benoit MZ, Jonas K, Alexandra T, Desire DD, Pierre K, et al. Antidiabetic and antioxidant effects of Annona muricate (Annonaceae), aqueous extract on streptozotocin-induced diabetic rats. J Ethnopharmacol 2014; 151(2): 784-790. Ali RB, Atangwho IJ, Kaur N, Mohamed EAH, Mohamed AJ, Asmawi MZ, et al. Hypoglycemic and anti-hyperglycemic study of Phaleria macrocarpa fruits pericarp. J Med Plants Res 2012; 6(10): 1982-1990. Shen Y, Fukushima M, Ito Y, Murak E, Hosono T, Seki T, et al. Verification of the antidiabetic effects of cinnamon (Cinnamomum zeylanicum) using insulin uncontrolled type 1 diabetic rats and cultured adipocytes. Biosci Biotechnol Biochem 2010; 74: 2418-2425. Juárez-Rojop IE, Díaz-Zagoya JC, Ble-Castillo JL, Miranda-Osorio PH, Castell-Rodríguez AE, Tovilla-Zárate CA, et al. Hypoglycemic effect of Carica papaya leaves in streptozotocin-induced diabetic rats. BMC Complement Altern Med 2012; 12: 236-247. Al-Shamaony L, Al-Khazraji SM, Twaiji IIA. Hypoglycemic effect of Artemisia herba alba ll. Effect of a valuable extract on some blood parameters in diabetic animals. J Ethnopharmacol 1994; 43(3): 167-171. Adiga S, Bairy KL, Meharban A, Punita ISR. Hypoglycemic effect of aqueous extract of Trichosanthes dioica in normal and diabetic rats. Int J Diabetes Dev Ctries 2010; 30(1): 38-42.